I grew up largely not eating sugared cereals, raisin bran being a notable exception. But I’ve always been happy with grape nuts, bran flakes, corn flakes, even cheerios from time to time (not a favorite). So once when I was a teen and was on a trip with fellow teens, we stayed overnight at a place that, in the morning, had long tables with every kind of cereal that existed. My mind was blown – I mean, I’d seen them in the store but hardly paid attention as they were never on the shopping list…. but here – here I could pick and choose and have a bowl. I looked long and hard to make a wise choice and eventually ended up with Fruity Pebbles just because I’ve always been a fan of colour, and while the chocolate cereals were tempting, the fruity stuff truly had the draw of forbidden fruit. So I got a bowl of Fruity Pebbles, poured in my milk, and sat down ready to have my mind blown. What I found was that they quickly turned the milk grey – GREY – and became a soggy, slightly sweet mush of lightly flavoured globs that tasted slightly of nothing. 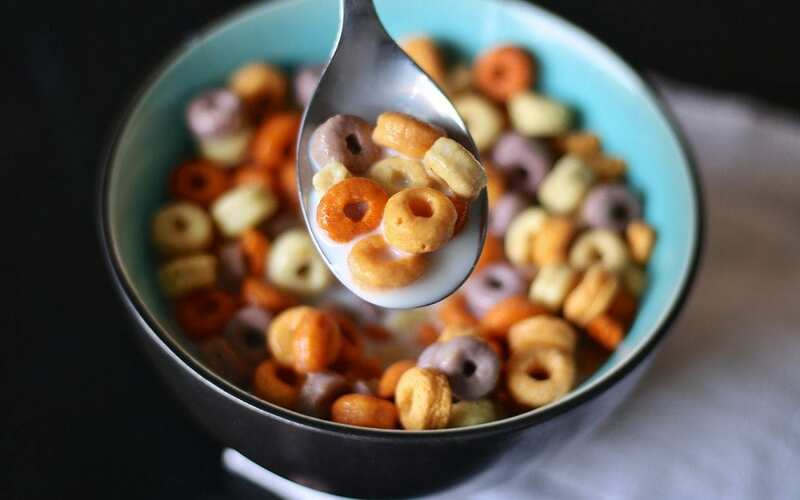 And I do have to admit to a minor lie – when I was very young, I got Lucky Charms from time to time, which I adored and ate as much as a snack as I did as cereal. Saw Chocolate Lucky Charms a few months ago in the store and just had to – first time having the cereal in any form in 30 years. It wasn’t amazing – but I knew better than to have them in milk, and the little chalky “marshmallows” were as good and bad as I remembered. I felt like I was eating the human equivalent of cat food – human kibble – not meaty-icky, just a similarly designed product. It was good, but that has satisfied my sugary-cereal itch indefinitely.